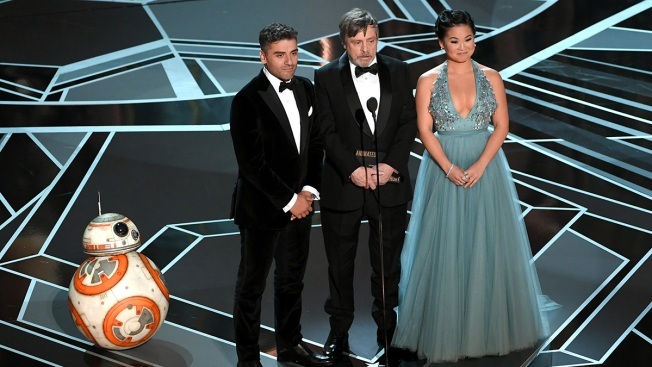 BB-8, actors Oscar Isaac, Mark Hamill and Kelly Marie Tran speak onstage during the 90th Annual Academy Awards at the Dolby Theatre at Hollywood & Highland Center on March 4, 2018 in Hollywood, California. Kelly Marie Tran is breaking her silence about online harassment months after deleting her Instagram account. In an essay published Tuesday in The New York Times, the "Star Wars: The Last Jedi" actress wrote it "wasn't their words, it's that I started to believe them." She wrote the words seemed to confirm what growing up as a woman and a person of color had taught her, that she belonged "in margins and spaces." She wrote she started blaming herself and felt brainwashed into believing her existence was "limited to the boundaries of another person's approval." Tran will reprise her role as Rose Tico in next year's "Star Wars: Episode IX."